For other uses, see Bixi (disambiguation). Not to be confused with Bixie. Bixi, or Bi Xi (Wade–Giles: Pi-hsi), is a figure from Chinese mythology. One of the 9 sons of the Dragon King, he is depicted as a dragon with the shell of a turtle. Stone sculptures of Bixi have been used in Chinese culture for centuries as a decorative plinth for commemorative steles and tablets, particularly in the funerary complexes of its later emperors and to commemorate important events, such as an imperial visit or the anniversary of a World War II victory. They are also used at the bases of bridges and archways. Sculptures of Bixi are traditionally rubbed for good luck, which can cause conservation issues. They can be found throughout East Asia in Japan, Korea, Vietnam, Mongolia, and even the Russian Far East. The tradition of tortoise-mounted stelae originated no later than early 3rd century (late Han dynasty). According to the 1957 survey by Chêng Tê-k'un (鄭徳坤), the earliest extant tortoise-borne stele is thought to be the one at the tomb of Fan Min (樊敏), in Lushan County, Ya'an, Sichuan. Victor Segalen had earlier identified the stele as a Han dynasty monument; present-day authors agree, usually giving it the date of 205 AD. The stele has a rounded top with a dragon design in low relief - a precursor to the "two intertwined dragons" design that was very common on such steles even in the Ming and Qing Dynasties, over a thousand years later. In the collection of the Nanjing Museum there is a hunping funerary jar, dating to 272 AD, with a miniature architectural composition on top, depicting, among other objects, a tortoise carrying a stele erected by the Jin dynasty governor of Changsha in honor of a local dignitary. Perhaps the best known extant early example of the genre is the set of four stele-bearing tortoises at the mausoleum of Xiao Xiu (475-518), who was the younger brother of the first Liang dynasty emperor Wu (Xiao Yan), near Nanjing. The bixi tradition flourished during the Ming and Qing dynasties. The Ming founder, the Hongwu Emperor, in the first year after the dynasty had been proclaimed (1368), adopted regulations, allowing tortoise-based funerary tablets to the higher ranks of the nobility and the mandarinate. He tightened the rules in 1396, leaving only the highest nobility (those of the gong and hou ranks) and the officials of the top 3 ranks eligible for bixi-based stelae. The type of dragons crowning the tortoise-born stele, and the type and number of other statuary at the tomb site, were prescribed by the same regulations as well. At the Hongwu Emperor's own mausoleum, a huge bixi holding the so-called Shengde stele welcomes visitors at the Sifangcheng pavilion at the entrance of the mausoleum complex. Three centuries later (1699), the Kangxi Emperor of the Qing dynasty visited Nanjing and contributed another tortoise, with a stele praising the founder of the Ming, comparing him to the founders of the great Tang and Song dynasties of the past. The Hongwu Emperor's tortoise tradition was continued by the later Ming and Qing emperors, whose mausoleums are usually decorated by bixi-born steles as well. Even the self-declared emperor Yuan Shikai was posthumously honored with a bixi-based stele in Anyang, as was the Republic of China Premier Tan Yankai (1880–1930), whose stele near Nanjing's Linggu Temple had its inscription erased after the Communist Revolution. Occasionally, a foreign head of state was honored with a bixi as well, as it happened to the sultan of Brunei Abdul Majid Hassan, who died during his visit to China in 1408. The sultan's grave, with a suitably royal bixi-based monument, was discovered in Yuhuatai District south of Nanjing in 1958. After an ancient Christian stele was unearthed in Xi'an in 1625, it, too, was put on the back of a tortoise. 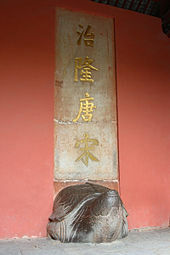 In 1907, this so-called Nestorian Stele was moved to the Stele Forest Museum along with its tortoise. These days, long-lost bixi continue to be unearthed during archaeological excavations and construction work. Among the most remarkable finds is the discovery of a huge 1200-year-old in Zhengding (Hebei Province) in June 2006. The stone turtle is 8.4 m long, 3.2 m wide, and 2.6 m tall, and weighs 107 tons. It has since been moved to Zhengding's Kaiyuan Temple. The concept of a tortoise-borne, dragon-crowned stele was early adopted by China's northern neighbors. The earliest extant monument of the Turkic Kaganate - the so-called "Bugut Stele" of the late 6th century from Arkhangai Province in western Mongolia with a Sogdian and (most likely) Sanskrit inscription was installed on a stone tortoise. It is now in the provincial capital, Tsetserleg. According to the Turkish researcher Cengiz Alyilmaz, it was the design of this stele that influenced the builders of the important 8th-century stelae with Old Turkic inscriptions, many of which also stood on tortoises. Among them, the most accessible one is probably Bayanchur Khan's (Eletmish Bilge Kağan)'s Terhin-Gol stele (753 AD), now in the Mongolian Academy of Sciences in Ulan Bator. Later, the Jurchen Jin dynasty (1115-1234) and the Mongol Yuan dynasty erected tortoise-based monuments as well, some of which have been preserved in Russia's Ussuriysk and Mongolia's Karakorum. In Japan, this form of tortoise-supported stele is found primarily at the graves of prominent Kamakura period (1185–1333) figures, especially in the city of Kamakura. Another large collection of tortoise-borne stelae, spanning 17th through 19th centuries, can be seen at the cemetery of the Tottori Domain daimyō outside Tottori. Otherwise, the form does not seem to have been particularly popular in earlier or later times. In Korea, tortoise-borne stelae are known already during the Three Kingdoms of Korea period (e.g., the Tombstone of King Muyeol of Silla, erected 661). Monuments of this type have been preserved from the later Goryeo dynasty as well, such as the Stele of Bongseon Honggyeongsa (1026). Vietnam also has a long tradition of tortoise-born stelae, where they commemorate emperor Lê Lợi as well as the graduates of the Confucian academy at Hanoi's Temple of Literature. While there is no indigenous tradition of erecting stelae on tortoise-shaped pedestals in the United States, a Qing period bixi can be seen on campus of the Harvard University in Cambridge, Massachusetts. This bixi was given as a gift to Harvard in 1936 by the members of Harvard Clubs in China; an appropriate text was carved for the occasion on the tablet carried by the tortoise. According to Victor Segalen's assessment, the early (Han and the Six Dynasties) stone tortoises were artistic images of quite real aquatic turtles. The creatures looked quite realistic through the Song dynasty, when huge tortoise pedestals, such as the ones in Shou Qiu near Qufu, or the one in Dai Miao at Mount Tai were erected. The early-Ming specimens, while still definitely chelonian, had sprouted small ears; sides of their heads and their carapaces are often decorated by a leaf-like design. They usually have prominent teeth, which real-life turtles don't. By the mid-Qing (the 18th century), however, the stele-bearing tortoise becomes the characteristic dragon-headed bixi. Gravesites of samurai Shimazu Tadahisa (d. 1227) and Mōri Suemitsu (1202-1247), the founders of the Shimazu and Mōri clans respectively, Kamakura, Japan. The Harvard Bixi in the United States was produced in China in the 18th century. The bixi at Lingyin Temple, Hangzhou, with the characters "Lingyin" (靈隱) written on the stele. According to some 19th-century western authors, the Chinese tradition of using a tortoise as a pedestal may have a common source with the Indian legend of the world being held up by a giant turtle. The word bi 贔 or bixi 贔屭 (also written with a variant character, 贔屓) is translated by Chinese dictionaries as "strong", "capable to support great weight". The word bixi is attested already in Zhang Heng's (78-139) "Western Metropolis Rhapsody" (Xi Jing Fu), which mentions "the great strides" of the giant divine bixi. Zhang Heng's follower Zuo Si (250 - 305) in his Wu Capital Rhapsody (Wu Jing Fu) explicitly associates the attribute bixi with the legendary giant turtle ao, whose head supports a sacred mountain. The xibi looks like a tortoise. By its nature it likes to carry heavy weights. It used to be employed to support stone tablets. Lu Rong claims that his list (including the total of 14 creatures) is based on the ancient books of beasts and supernatural creatures, the Shan Hai Jing and the Bo Wu Zhi (博物志); however, as the modern researchers Yang Jingrong and Liu Zhixiong note, that is not the case, and the names, much more likely, were taken by Lu Rong from the folklore of his times. The baxia has an innate love for carrying weights; the creature [that] now [is] under tablets is its image. ... The bixi has an innate love for literature; the dragons [that] now [are] on the sides of tablets are its image. The bixi looks like a tortoise, and likes to carry heavy weights; [he] is the tortoise-carrier (guifu) now [seen] under stone tablets. The stone tortoise cherishes in its heart the love of the sea. How can I forget my home village? A bixi plays a key role in a ghost story, "The Spirit of the Stone Tortoise" (贔屭精, Bixi jing), from Yuan Mei's (1716–1797) collection What the Master does not Speak of. The French poet and researcher Victor Segalen (1878–1919), who published both a scholarly book about China's stelae and a book of poetry-in-prose about them, was also impressed by the "truly emblematic" stone tortoises, their "firm gestures and elegiac posture". Today, the image of the bixi continues to inspire modern Chinese artists. As with other stone (particularly, marble and limestone) statuary, bixi turtles and their stelae are vulnerable to acid rain (or, in winter, acid snow). On the Harvard University campus, the curators of its turtle protect it against the "acid snow" by wrapping it with a waterproof cover for the winter. A more bixi-specific concern is the wear to the creatures' noses from the people who touch them for good luck. At Hanoi's Temple of Literature, highly popular with visitors, this has become a sufficient concern to the site's managers as to make them develop plans for introducing creative landscaping and structural obstacles to keep visitors from touching the temple's 82 stone turtles. Wikimedia Commons has media related to Bixi. ^ Roberts, Jeremy. Chinese Mythology, A to Z, p. 61. "Dragon's Nine Sons". 2nd ed. Chelsea House (New York), 2010. Accessed 22 November 2013. ^ a b Chêng, Tê-kun (1957), Archaeological studies in Szechwan, Cambridge University Press, p. 144 . The author's name would be spelled Zheng Dekun in Pinyin. ^ Dien, Albert E. (2007), Six dynasties civilization, Early Chinese civilization series, Yale University Press, p. 190, ISBN 0-300-07404-2 A reconstruction of the original form of the ensemble is shown in Fig. 5.19. ^ de Groot, Jan Jakob Maria (1892a), The Religious System of China, II, Brill Archive, pp. 451–452 . ^ 明孝陵两大“碑石之谜”被破解 Archived 2012-10-18 at the Wayback Machine (Solving the two great riddles of the Ming Xiaoling's stone tablets). People's Daily, 2003-06-13. Quote regarding the Kangxi's stele text and its meaning: "清朝皇帝躬祀明朝皇帝 ... 御书“治隆唐宋”（意思是赞扬朱元璋的功绩超过了唐太宗李世民、宋高祖赵匡胤）"; regarding the dimensions of the stele and its tortoise: "康熙御碑孝陵碑殿中部主碑，是清康熙三十八年（1699年）由康熙皇帝爱新觉罗·玄烨所立，高3.85米，宽1.42米，上阴刻楷书“治隆唐宋”4字，字径0.68米，碑座为石制龟趺，高1.06米。"
^ Photo and description of the Kangxi's stele. The inscription is interpreted as "His reign was as glorious as that of the Tang and Song"
^ Keevak, Michael (2008), The Story of a Stele: China's Nestorian Monument and Its Reception in the West, 1625-1916, pp. 5–6, 105, 117 (Fig 38), ISBN 962-209-895-9 . The first two images reproduced in Keevak's book had appeared earlier in Henri Havret (1848-1901), La stele chrétienne de Si-ngan fou (part 1), Variétés sinologiques No. 7, Paris, 1895 (near the front cover, and page 139, respectively). As Havret comments (p. 142), looking at the early drawings it's rather easy to mistake the tortoise for a "horrible bat"! ^ Mayers, William Frederick (1874), The Chinese reader's manual: A handbook of biographical, historical, mythological and general literary reference, Shanghai: American Presbyterian Mission Press, p. 94 , section 299 ("Kwei, 龟"). Quote: "The conception is probably derived from the same source with that of the Hindoo legend of the tortoise supporting an elephant, on whose back the existing world reposes." Mayers is also quoted in: Williams, Charles Alfred Speed (1988), Chinese Symbolism and Art Motifs: An Alphabetical Compendium of Antique Legends and Beliefs, as Reflected in the Manners and Customs of the Chinese, Tuttle Publishing, p. 405, ISBN 0-8048-1586-0 (reprint of the 1941 edition). ^ Li Dongyang's Huai Lu Tang Ji (懷麓堂集) quoted in Yang Jingrong and Liu Zhixiong (2008): "霸上（霸下），平生好負重，今碑座獸是其遺像。... 贔屭，平生好文，今碑兩旁龍是其遺像。"
^ Yang Shen's Sheng'an Ji (升庵集) quoted in Yang Jingrong and Liu Zhixiong (2008): "贔屭，形似龜，好負重，今石碑下龜趺是也。"
^ de Groot, Jan Jakob Maria (1892b), The Religious System of China, IV, Brill Archive, p. 341 . The legend, and the reference to Lu Ji, comes from the book Shu Yi Ji (述异记, "Extraordinary stories"), commonly ascribed to Ren Fang (460—508). The story from the tortoise from a seaside hill (海畔石龜), as well as the one about another sea-going stone turtle from Linyi County (臨邑縣), and their translations to Modern Standard Mandarin, can be found here Archived July 12, 2006, at the Wayback Machine. ^ Lu Ji's poem: «石龟尚怀海。我宁忘故乡 Archived July 24, 2011, at the Wayback Machine». Unlike modern Chinese editions, de Groot 1892b, p. 341 has 亡 (to die) instead of 忘 (to forget), which changes the meaning of the second line to "I'd rather die in my home village." ^ Wang, Jing (1992), The story of stone: intertextuality, ancient Chinese stone lore, and the stone symbolism in Dream of the red chamber, Water margin, and The journey to the west, Duke University Press, pp. 252–254, ISBN 0-8223-1195-X , which includes the English translation of the relevant excerpt from the novel. The original text of the chapter can be seen e.g. at 水滸傳/第001回, starting from "只中央一個石碑，約高五六尺，下面石龜趺坐 ..."
^ Jennifer Thome, STRANGE OVERTONES: THE EXPRESSIONS OF RESENTMENT AND COMPASSION IN YUAN MEI’S WHAT THE MASTER DOES NOT SPEAK OF Archived September 3, 2009, at the Wayback Machine. M.A. thesis, Arizona State University, 2008. ^ Qiu Zhijie, "City of failure" - the print is based on the Sifangcheng pavilion in the Ming Xiaoling Mausoleum. Tortoise stelae in the Temples of Confucius and Yan Hui in Qufu - twenty-five bixi from the Temple of Confucius and Temple of Yan Hui in Qufu, from five dynasties, from Song to Qing. 杨静荣 (Yang Jingrong); 刘志雄 (Liu Zhixiong) (2008), 龙之源 (The Origin of the Dragon), 中国书店, Chapter 9, 龙的繁衍与附会——龙生九子 (Dragon's derived and associated creatures: The nine children of the dragon), ISBN 7-80663-551-3 (Section 1, Section 2, Section 3). This page was last edited on 12 February 2019, at 10:15 (UTC).